Pneumonia is the leading infectious cause of death worldwide. While inflammation is critically important in host response to microbial invasion, exaggerated inflammation can damage the lungs, contributing to respiratory failure and mortality. Corticosteroids are effective in reducing inflammation and can also cause immune suppression. Presently, clinicians are unable to reliably distinguish between exaggerated and appropriate immune response and thus cannot rapidly identify patients most likely to benefit from adjunctive corticosteroids. 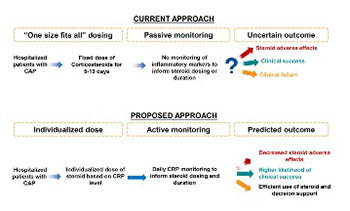 In this review, we propose a biomarker-guided, precision medicine approach to corticosteroid treatment, aimed to give these medications at appropriate dose and time and only to patients who have exaggerated inflammation.